OLetter L D from PR SIDENT theEPresident JENNA FOO Hi guys! I can’t believe that the service year is already over and this is my last message in the Locksmith to you all :( I had such an amazing year and I can’t thank everyone enough for supporting me as president and believing in me despite all of my flaws. Although I’m not president anymore, I will never stop being a member of StuyKC and I’ll always be around if anyone wants to hit me up! (You might see me at some events still hehe) This year’s new board has already started doing some great things and I can’t wait to see what will happen in the future. Even though our new complete board was announced yesterday, both our cabinet and directors are already stepping up our game from last year which literally blows my mind. Anyways, StuyKC, thanks for a great run and I’ll see you guys around! Now, I know that sounds like a huge number but I know that together, with the help of our amazing New Projects Committee, we will be able to work our way toward that goal. For our fundraising goal this year, it will be $10,000!!! Although we were unable to hit it last service year, I strongly believe that with our treasurer, our Fundraising Committee, and all of you guys, we will be able to raise five digits for charities. I hope that as a club this year, we will be able to reach new heights and I cannot wait to see what we accomplish this service year. O LR DW VI P RPresident EN ST IDENT N E P Efrom S D E Letter Letter from the the President Letter from the President P N AT NG PER EN SY I DW EN Since this is my last cab paragraph, I want to say that it's been an amazing service year and I've enjoyed being Vice President. I hope you guys had fun this service year and that I made it a bit more rewarding for you guys! I hope all you freshmen stay dedicated, attend events, and learn to grow because Key Club will bring you new experiences and challenges. All of you make Key Club what it is and I'm glad that there's so many dedicated members who will continuously put effort into this club and bring it to new heights in the future. All of you are AMAZING because all of you are KEY CLUBBERS and even though I'm no longer VP, I look forward to what's to comeÂ . Hi everyone! For those of you who don’t know me, I’m David, your new vice president for the 2019-2020 service year. First, I’d like to thank our amazing previous vice president Penny for all the hard work she put in her service year and all the tips she’s given me to jump start what will hopefully be another successful service year. OLD N E W V I C E R E S IT DR EE NR T P E S IR D E N O N LR E D W TP EPresident A ST U Letter Letter from from the President P R S Ithe D N Letter from the President Letter from the President Letter from the President This past service year has been crazy to say the least. It seemed like just yesterday when I was elected to be treasuerer of the 2018-2019 service year. Justin had done a great job during his year and it was needless to say that I was worried. I was worried that I would fail miserably and a disappointment. After setting a high goal for myself, I jumped right into planning fundraisers. Now with nearly $10,000 raised (we might have surpassed, I have to check), I can say that I wasn’t as much of a disappointment as I thought. But everything that I had accomplished this year was thanks to my amazing fundraising directors, Alan and Vincent, along with my amazing fundraising committee. Our fundraising committee might’ve been small but it was the best, closest, and functional committee StuyKC had had. You guys are my pride and I’m so thankful for every single one of you. There are times where I felt like I have hit rock bottom. When there wasn’t enough signups for a fundraiser, when I was having difficulty balancing school and fundraising while still attending events, when I felt like I was failing as treasurer and wasn’t doing enough. It was then that I decided that I would just try my best and enjoy serving as. N E W P E S IIthe D E N T O LR D N E W Letter Letter from from the President P R E SO D E NE TD I T O R Letter from the President Letter from the President N E W / LPresident D Letter from the President P R E D N VA IC PIL S IT DENT P RE ES S IR DE E N T R C H E JE O H Hi guys! 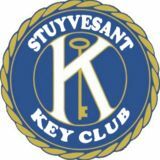 It my pleasure to be serving as Stuyvesant Key Club’s Editor for the 2019-2020! Key Club has taken a big role in my life; these last two service years have helped me find my closest friends. 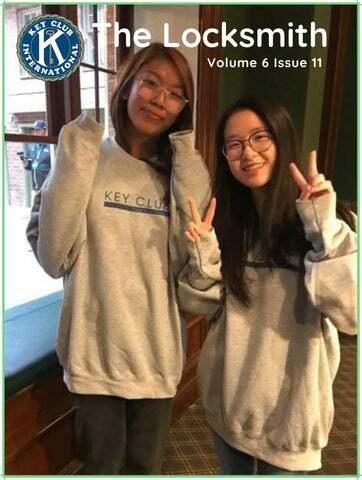 Thank you to the Old Cab for keeping everything intact (EXTREME thanks to Freya Zhu, Jenna Foo, and Tiffany Zhong for NEVER sending in their cab paras on time - even for this issue. Some things never change :/). I plan on making major changes (as you can see from this issue in comparison to the last) in order to make The Locksmith more appealing. Last year, we transitioned from Google Slides to Canva (a major improvement!!!) and nearly quartered the original length of the Locksmith. This year, while I do plan on making design changes, my main goal is to have The Locksmith become well known among Key Clubbers. A lot of us are guilty of never reading issues that we put our blood, sweat, and tears into and I plan on increasing readership. 31st. This video will be a great way to capture the various memories we made there and introduce LTC to those who haven’t gone. I will also work to update our various new events and fundraisers on the website, including our Avengers Endgame and Chipotle fundraisers. I am super thrilled to be serving you guys, and I promise to work extra hard to meet all of your expectations. ICON ICON is Key Club's International Convention. Clubs from around the globe come together in a larger scale version of LTC. This year, ICON is in Baltimore, Maryland from July 1st-7th. For more information, click here. What is Key Club? Most would say it’s a volunteering club; I would say it’s a warm and supportive family. I joined Key Club on a whim in my freshman year, focusing solely on the hours. Slowly, however, Key Club became more and more relevant in my life from attending more events. From Key Club, I've gained so much more than just hours. Through Key Club, I can help the community around us and support causes I believe in. I recently attended the annual Thirst Gala hosted by CCNY and their demonstration was truly powerful- how communities around the world lacked access to clean, safe drinking water was mind blowing, something that we usually take for granted in our daily lives. But this won’t stay the same forever; we are the generation to create change. We are the generation to end the water crisis and so many other problems. To end, I am so proud to be serving as your new treasurer- let’s make the 2019-2020 service year the best one yet.